Marine ecosystems, the largest of all ecosystems, cover approximately 71% of the Earth's surface and contain approximately 97% of the planet's water. They generate 32% of the world's net primary production. They are distinguished from freshwater ecosystems by the presence of dissolved compounds, especially salts, in the water. Approximately 85% of the dissolved materials in seawater are sodium and chlorine. Seawater has an average salinity of 35 parts per thousand of water. Actual salinity varies among different marine ecosystems. A classification of marine habitats. Marine ecosystems can be divided into many zones depending upon water depth and shoreline features. The oceanic zone is the vast open part of the ocean where animals such as whales, sharks, and tuna live. The benthic zone consists of substrates below water where many invertebrates live. The intertidal zone is the area between high and low tides; in this figure it is termed the littoral zone. Other near-shore (neritic) zones can include estuaries, salt marshes, coral reefs, lagoons and mangrove swamps. In the deep water, hydrothermal vents may occur where chemosynthetic sulfur bacteria form the base of the food web. Classes of organisms found in marine ecosystems include brown algae, dinoflagellates, corals, cephalopods, echinoderms, and sharks. Fishes caught in marine ecosystems are the biggest source of commercial foods obtained from wild populations. Environmental problems concerning marine ecosystems include unsustainable exploitation of marine resources (for example overfishing of certain species), marine pollution, climate change, and building on coastal areas. Freshwater ecosystems cover 0.78% of the Earth's surface and inhabit 0.009% of its total water. They generate nearly 3% of its net primary production. Freshwater ecosystems contain 41% of the world's known fish species. Lotic: faster moving water, for example streams and rivers. Wetlands: areas where the soil is saturated or inundated for at least part of the time. The three primary zones of a lake. Lake ecosystems can be divided into zones. One common system divides lakes into three zones (see figure). 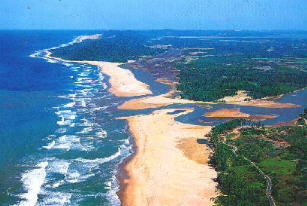 The first, the littoral zone, is the shallow zone near the shore. This is where rooted wetland plants occur. The offshore is divided into two further zones, an open water zone and a deep water zone. In the open water zone (or photic zone) sunlight supports photosynthetic algae, and the species that feed upon them. In the deep water zone, sunlight is not available and the food web is based on detritus entering from the littoral and photic zones. Some systems use other names. The off shore areas may be called the pelagic zone, the photic zone may be called the limnetic zone and the aphotic zone may be called the profundal zone. Inland from the littoral zone one can also frequently identify a riparian zone which has plants still affected by the presence of the lake—this can include effects from windfalls, spring flooding, and winter ice damage. The production of the lake as a whole is the result of production from plants growing in the littoral zone, combined with production from plankton growing in the open water. Wetlands can be part of the lentic system, as they form naturally along most lake shores, the width of the wetland and littoral zone being dependent upon the slope of the shoreline and the amount of natural change in water levels, within and among years. Often dead trees accumulate in this zone, either from windfalls on the shore or logs transported to the site during floods. This woody debris provides important habitat for fish and nesting birds, as well as protecting shorelines from erosion. Two important subclasses of lakes are ponds, which typically are small lakes that intergrade with wetlands, and water reservoirs. Over long periods of time, lakes, or bays within them, may gradually become enriched by nutrients and slowly fill in with organic sediments, a process called succession. When humans use the watershed, the volumes of sediment entering the lake can accelerate this process. The addition of sediments and nutrients to a lake is known as eutrophication. Ponds are small bodies of freshwater with shallow and still water, marsh, and aquatic plants. They can be further divided into four zones: vegetation zone, open water, bottom mud and surface film. The size and depth of ponds often varies greatly with the time of year; many ponds are produced by spring flooding from rivers. Food webs are based both on free-floating algae and upon aquatic plants. There is usually a diverse array of aquatic life, with a few examples including algae, snails, fish, beetles, water bugs, frogs, turtles, otters and muskrats. Top predators may include large fish, herons, or alligators. Since fish are a major predator upon amphibian larvae, ponds that dry up each year, thereby killing resident fish, provide important refugia for amphibian breeding. Ponds that dry up completely each year are often known as vernal pools. Some ponds are produced by animal activity, including alligator holes and beaver ponds, and these add important diversity to landscapes. The major zones in river ecosystems are determined by the river bed's gradient or by the velocity of the current. Faster moving turbulent water typically contains greater concentrations of dissolved oxygen, which supports greater biodiversity than the slow moving water of pools. These distinctions form the basis for the division of rivers into upland and lowland rivers. The food base of streams within riparian forests is mostly derived from the trees, but wider streams and those that lack a canopy derive the majority of their food base from algae. Anadromous fish are also an important source of nutrients. Environmental threats to rivers include loss of water, dams, chemical pollution and introduced species. A dam produces negative effects that continue down the watershed. The most important negative effects are the reduction of spring flooding, which damages wetlands, and the retention of sediment, which leads to loss of deltaic wetlands. Wetlands are dominated by vascular plants that have adapted to saturated soil. There are four main types of wetlands: swamp, marsh, fen and bog (both fens and bogs are types of mire). Wetlands are the most productive natural ecosystems in the world because of the proximity of water and soil. Hence they support large numbers of plant and animal species. Due to their productivity, wetlands are often converted into dry land with dykes and drains and used for agricultural purposes. The construction of dykes, and dams, has negative consequences for individual wetlands and entire watersheds. Their closeness to lakes and rivers means that they are often developed for human settlement. Once settlements are constructed and protected by dykes, the settlements then become vulnerable to land subsidence and ever increasing risk of flooding. The Louisiana coast around New Orleans is a well-known example; the Danube Delta in Europe is another. Aquatic ecosystems perform many important environmental functions. For example, they recycle nutrients, purify water, attenuate floods, recharge ground water and provide habitats for wildlife. Aquatic ecosystems are also used for human recreation, and are very important to the tourism industry, especially in coastal regions. The health of an aquatic ecosystem is degraded when the ecosystem's ability to absorb a stress has been exceeded. A stress on an aquatic ecosystem can be a result of physical, chemical or biological alterations of the environment. Physical alterations include changes in water temperature, water flow and light availability. Chemical alterations include changes in the loading rates of biostimulatory nutrients, oxygen consuming materials, and toxins. Biological alterations include over-harvesting of commercial species and the introduction of exotic species. Human populations can impose excessive stresses on aquatic ecosystems. There are many examples of excessive stresses with negative consequences. Consider three. The environmental history of the Great Lakes of North America illustrates this problem, particularly how multiple stresses, such as water pollution, over-harvesting and invasive species can combine. The Norfolk Broadlands in England illustrate similar decline with pollution and invasive species. Lake Pontchartrain along the Gulf of Mexico illustrates the negative effects of different stresses including levee construction, logging of swamps, invasive species and salt water intrusion. An ecosystem is composed of biotic communities that are structured by biological interactions and abiotic environmental factors. Some of the important abiotic environmental factors of aquatic ecosystems include substrate type, water depth, nutrient levels, temperature, salinity, and flow. It is often difficult to determine the relative importance of these factors without rather large experiments. There may be complicated feedback loops. For example, sediment may determine the presence of aquatic plants, but aquatic plants may also trap sediment, and add to the sediment through peat. The amount of dissolved oxygen in a water body is frequently the key substance in determining the extent and kinds of organic life in the water body. Fish need dissolved oxygen to survive, although their tolerance to low oxygen varies among species; in extreme cases of low oxygen some fish even resort to air gulping. Plants often have to produce aerenchyma, while the shape and size of leaves may also be altered. Conversely, oxygen is fatal to many kinds of anaerobic bacteria. Nutrient levels are important in controlling the abundance of many species of algae. The relative abundance of nitrogen and phosphorus can in effect determine which species of algae come to dominate. Algae are a very important source of food for aquatic life, but at the same time, if they become over-abundant, they can cause declines in fish when they decay. Similar over-abundance of algae in coastal environments such as the Gulf of Mexico produces, upon decay, a hypoxic region of water known as a dead zone. The salinity of the water body is also a determining factor in the kinds of species found in the water body. Organisms in marine ecosystems tolerate salinity, while many freshwater organisms are intolerant of salt. The degree of salinity in an estuary or delta is an important control upon the type of wetland (fresh, intermediate, or brackish), and the associated animal species. Dams built upstream may reduce spring flooding, and reduce sediment accretion, and may therefore lead to saltwater intrusion in coastal wetlands. Freshwater used for irrigation purposes often absorbs levels of salt that are harmful to freshwater organisms. The biotic characteristics are mainly determined by the organisms that occur. For example, wetland plants may produce dense canopies that cover large areas of sediment—or snails or geese may graze the vegetation leaving large mud flats. Aquatic environments have relatively low oxygen levels, forcing adaptation by the organisms found there. For example, many wetland plants must produce aerenchyma to carry oxygen to roots. Other biotic characteristics are more subtle and difficult to measure, such as the relative importance of competition, mutualism or predation. There are a growing number of cases where predation by coastal herbivores including snails, geese and mammals appears to be a dominant biotic factor. Autotrophic organisms are producers that generate organic compounds from inorganic material. Algae use solar energy to generate biomass from carbon dioxide and are possibly the most important autotrophic organisms in aquatic environments. The more shallow the water, the greater the biomass contribution from rooted and floating vascular plants. These two sources combine to produce the extraordinary production of estuaries and wetlands, as this autotrophic biomass is converted into fish, birds, amphibians and other aquatic species. Chemosynthetic bacteria are found in benthic marine ecosystems. These organisms are able to feed on hydrogen sulfide in water that comes from volcanic vents. Great concentrations of animals that feed on these bacteria are found around volcanic vents. For example, there are giant tube worms (Riftia pachyptila) 1.5 m in length and clams (Calyptogena magnifica) 30 cm long. Heterotrophic organisms consume autotrophic organisms and use the organic compounds in their bodies as energy sources and as raw materials to create their own biomass. Euryhaline organisms are salt tolerant and can survive in marine ecosystems, while stenohaline or salt intolerant species can only live in freshwater environments. ^ Alexander, David E. (1 May 1999). Encyclopedia of Environmental Science. Springer. ISBN 0-412-74050-8. ^ "University of California Museum of Paleontology: The Marine Biome". Retrieved 27 September 2018. ^ a b c d e f g Alexander, David E. (1 May 1999). Encyclopedia of Environmental Science. Springer. ISBN 0-412-74050-8. ^ a b United States Environmental Protection Agency (2 March 2006). "Marine Ecosystems". Retrieved 25 August 2006. ^ a b Daily, Gretchen C. (1 February 1997). Nature's Services. Island Press. ISBN 1-55963-476-6. ^ Vaccari, David A. (8 November 2005). Environmental Biology for Engineers and Scientists. Wiley-Interscience. ISBN 0-471-74178-7. ^ Clegg, J. (1986). Observer's Book of Pond Life. Frederick Warne, London. 460 p. p.160-163. ^ a b c d e f g h i Keddy, Paul A. (2010). Wetland Ecology. Principles and Conservation. Cambridge University Press. p. 497. ISBN 978-0-521-51940-3. ^ Keddy, P.A., D. Campbell, T. McFalls, G. Shaffer, R. Moreau, C. Dranguet, and R. Heleniak. 2007. The wetlands of lakes Pontchartrain and Maurepas: past, present and future. Environmental Reviews 15: 1- 35. ^ Gastescu, P. (1993). The Danube Delta: geographical characteristics and ecological recovery. Earth and Environmental Science, 29, 57–67. ^ a b c Loeb, Stanford L. (24 January 1994). Biological Monitoring of Aquatic Systems. CRC Press. ISBN 0-87371-910-7. ^ a b Vallentyne, J. R. (1974). The Algal Bowl: Lakes and Man, Miscellaneous Special Publication No. 22. Ottawa, ON: Department of the Environment, Fisheries and Marine Service. ^ Moss, B. (1983). The Norfolk Broadland: experiments in the restoration of a complex wetland. Biological Reviews of the Cambridge Philosophical Society, 58, 521–561. ^ Keddy, P. A., Campbell, D., McFalls T., Shaffer, G., Moreau, R., Dranguet, C., and Heleniak, R. (2007). The wetlands of lakes Pontchartrain and Maurepas: past, present and future. Environmental Reviews, 15, 1–35. ^ Graham, J. B. (1997). Air Breathing Fishes. San Diego, CA: Academic Press. ^ a b c d Manahan, Stanley E. (1 January 2005). Environmental Chemistry. CRC Press. ISBN 1-56670-633-5. ^ Smith, V. H. (1982). The nitrogen and phosphorus dependence of algal biomass in lakes: an empirical and theoretical analysis. Limnology and Oceanography, 27, 1101–12. ^ Smith, V. H. (1983). Low nitrogen to phosphorus ratios favor dominance by bluegreen algae in lake phytoplankton. Science, 221, 669–71. ^ Turner, R. E. and Rabelais, N. N. (2003). Linking landscape and water quality in the Mississippi River Basin for 200 years. BioScience, 53, 563–72. ^ Silliman, B. R., Grosholz, E. D., and Bertness, M. D. (eds.) (2009). Human Impacts on Salt Marshes: A Global Perspective. Berkeley, CA: University of California Press. ^ Chapman, J.L. ; Reiss, M.J. (10 December 1998). Ecology. Cambridge University Press. ISBN 0-521-58802-2. Christensen V and Pauly D (eds.) (1993) Trophic models of aquatic ecosystems The WorldFish Center, issue 26 of ICLARM Technical Reports, volume 26 of ICLARM conference proceedings. ISBN 9789711022846. Moustakas A and Karakassis I (2005) "How diverse is aquatic biodiversity research?" Aquatic Ecology, 39: 367-375. Wikimedia Commons has media related to Freshwater ecosystems.